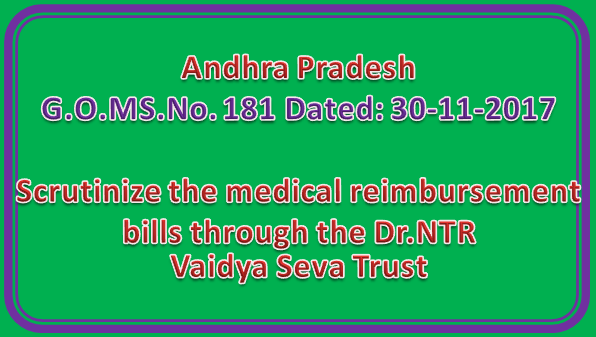 HM&FW – Dr.NTRVST – Scrutinize the medical reimbursement bills through the Dr.NTR Vaidya Seva Trust instead of Director of Public Health & Family Welfare and the Commissioner, APVVP to make more convenient to the Government Employees, Pensioners and their dependent family members – Orders – Issued. 4. The Director of Public Health & Family Welfare and the Commissioner, AP Vaidya Vidhana Parishad are directed to handover all the pending medical reimbursement bills to the Chief Executive Officer, Dr.NTR Vaidya Seva Trust with immediate effect and also requested to hand over all the related existing rules/Government Orders issued from time to time, if any, pertaining to medical reimbursement Scheme.